The food becomes the pleasure, the love, the friendship, and you. Giving your mind, body, and soul the love of sheer MAGIC of taste. In Macaroons, In Chocolate, In Cake never to waste. Created divinely from the hands set to meet. Macaroons by Al Strong; ... Al Strong is most certainly a person to visit when taking a trip to The Lake District. You will find him in Kendal Cumbria. He is there everyday except Sunday. 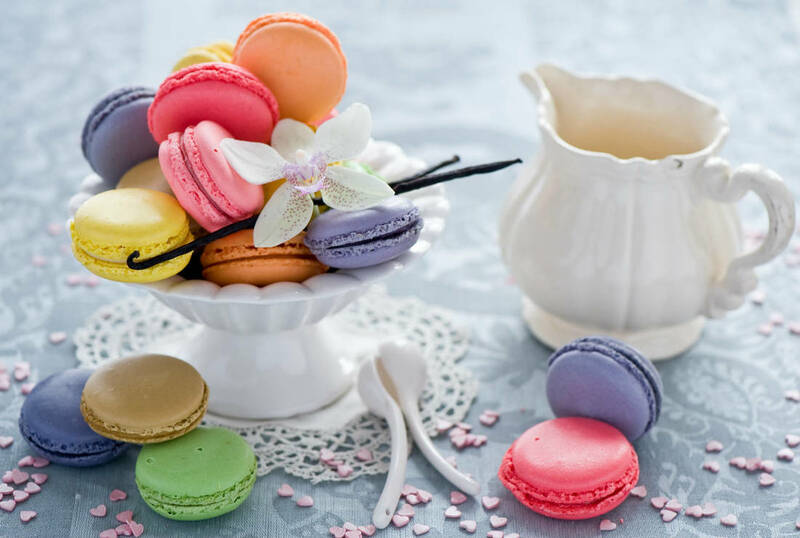 I have tasted Macaroons in many places, Paris, Montpellier, and more. And Al has the magic for certain in his Macaroons.A little bit of Magic to be sure. ( Pour etre' sur la magie a chaque bouchee' ) One bite, and will be hooked. Lemon, Raspberry, Vanilla, Almond, Chocolate Orange, Ginger, Salted Caramel, Lavender, White Chocolate Hazelnut, Mint, Rosewater, Nutmeg. ... Life is just a box of Macaroons. My Pleasure ... You Serve ... Very Well Indeed in a magical way. The Waterside Cafe & Bistro; This is one of my favorite places in Kendal The Lake District, it is beside the River Kent. The staff are to be very attentive indeed, as soon as you walk in you are looked after. It's fresh Cuisine. Very tasty indeed, more to the healthy side, but still Soul food, I have found something special, a Chocolate, and Date slice, very moreish. Well worth a visit, when the sun shines the glistening waters of the river become the mirror of the sky, you can sit outside, and enjoy the view. When the skies give way to the rain then take a seat inside, and enjoy the aroma of the food, it will be the spell to draw you into staying cosy, and warm, enjoying lunch, coffee, tea, and cake or whatever you desire. Every time I walk into this Bistro I am looked after. Please make the effort to see for yourself, you will not be disappointed. My Pleasure ... You Serve ... Very Well Indeed, every time I visit. I am now going to do some research with some of the food here, I am going to start with the cakes, as this is a special Bistro, it serves vegetarian dishes. ChocoBar Hot Chocolate House; ​Bowness on Windermere. Am I in Heaven, I do believe I am. Chocoholics welcome, you have everything that you need here. A neat hot chocolate cafe'. The chocolate is of the Vicar of Dibley sort. Lovers of The Vicar of Dibley, lovers of chocolate welcome to heaven. My glass mug had complete hot chocolate with Amaretto, on my plate neatly placed was a piece of Chocolate Cake, and a portion of fruit on the side. I am in Heaven for certain. If you are seeking a different beverage then they do serve coffee, and tea infusions. A certain must visit place for love. And for the love of Soul Food. My Pleasure ... You Serve ... Much to my delight. I had my Chocolate fix. The Fizzy Tart; Bowness on Windermere. A seat in the sun, and what a busy place with tourists, but I wanted to find out just what this cafe' was about, the definite fizz was Champagne, Prosecco, and some really interesting Cocktails. I had decided on a Bellini Peach Cocktail, and Chocolate with Almonds Slice. My Birthday had begun, and I was going to make sure that I was going to enjoy a Special Birthday for me. The Bellini was tasty, the Chocolate Slice happened to be one of the best. And the service was happy to serve, which is something that I like to see, service with a smile, and the waitresses certainly smiled. If you find yourself in Bowness on Windermere look for the Fizzy Tart, you will enjoy. My Pleasure ... You Serve ... Much to my delight it was tasty. Even though it was busy. 657 Chocolate House ... Kendal ... Aladdin's Cave ... This is a magical place to get lost in, every corner is full of tasty delights... My Favourite Chocolate House. Walking past without going in to see my favourite chocolate is something I find hard to do, and what's new to be tried. The variety of chocolate's are sublime, how we love are chocolate's, all so good for the soul, soul food to be sure. This is a quaint shop with a cafe' upstairs, small but so full of interesting, delicious goodies, they have all the chocolate's you need for the whole year through. ​​My favourite of course are of the Champagne variety, I could become the official taster for this Chocolate House, a great job I do believe. Come into Kendal, and take a look, browse to your hearts delight, and find your choice of Chocolate's. Heaven's Door is the Chocolate time. Friendly staff with a view to please. My Pleasure ... You Serve ... Thank you for the patience of my choices. Always happy to serve. I have also found a little area, the tea room above the shop, it serves the cakes of delightful pleasures. I have tried the Carrot Cake which has so much taste, walnuts, and spice, a must for everybody. The Chocolate Fudge Cake was delightfully divine. And the Triple Chocolate Cake was just that, triple chocolate, very rich, scrumptious, chocolate heaven. We all need chocolate sometimes it's a gift of sweetness. Capri ... AnaCapri ... Walking the paths in Ana Capri which is at the very top of Capri I had found myself a small Caffe, the name of this Caffe is; Caffe Michelangelo, so not only did I have my son Brendon with me, I had Arch Angel Michael standing tall, and in charge of protecting me. It was quiet, heavenly, and a chance to reflect in peace. I of course had the glass of Prosecco, a Coffee, and a slice of Chocolate Cake which was a slice of heaven, again Soul Food, with a gentle aim to please. I was happy, this would be the first time I had actually had found my peace time, and such a lovely Caffe to find it in. My Pleasure ... You Serve ... Thank you for the peace, my Souls delight. Holidays are time for healing, peace is my healing time. Sorrento ... La Dolce ... Gelateria ... Pasticceria ... This was a small caffe that I found as I was walking around before the bus took me to Amalfi. Caffe Latte, and Nuttella cake was the order of the day. All divine, and the service was attentive. I love these moments of self, as self is important. Italians always go to the best places, and if you want something good, delicious then follow the Italians, to find out where they have their coffee, and cake. My Pleasure ... You Serve ... Thank you for the respect, and understanding. I love the cakes. If I ever venture back I will see you again. I Giardini di Cataldo ... Lemoncello... I had found something special in Sorrento my favourite Lemoncello, and the Italian Ice-cream, here I was by myself, and in heaven. Watching as they were putting the Lemoncello into bottles, I made sure that I had already tasted the Lemoncello in the garden of Lemons. Now here I was sitting in the factory eating Ice-cream. How much better can a my life get. I had set my goals, and achieved them all. My Pleasure ... You Serve ... Thank You so much for the politeness, and for the extra Ice-cream. My time in Sorrento finished.... Thank you My Angels for a wonderful time regardless of the morons. The Capon Tree Cafe'. Brampton ... Tea for two, and even more. Kenny, with his buddy Titch came for tea with mummy, and me, and The Capon Tea Cafe' was the place to be. The Teapots were of the old sort, one that your grandmother, or favourite posh aunt would bring out on special occasions. I loved the way my daughter, and I were served as though we were royalty, noting is too much. The sandwiches were cut small, the choice was of brown, and white bread. Quiche, sausage rolls, cheese scones, then to la dulce, the dessert supreme, we had the delight of scones, jam, with cream, the chocolate cake, ginger cheese cake, and some small cakes. It was a delightful afternoon, a special time for my daughter, and I. A treat, as life is all about treats, and soul food for certain. Caffe Nero .... Costa Cofffee .... Brew Brothers ... Now this could be a competition between the three. I have these three places for me to enjoy in Kendal. In the weeks running up to Christmas I will be seeing who can offer me the best Christmas drink, with something Christmassy to eat, and who has the best Ambiance where friendly people are concerned, the most easy going, and the best Christmas spirit. ​Costa Coffee today, well I am not too sure about this, the gingerbread cream latte lacked the gingerbread taste, and the nutty for Christmas was slightly sickly. But we have 4 weeks to go, and more to try. The ambiance with the two small children I was chatting to was good, Christmas is coming, that certainly was understood. ​Caffe Nero ... Tis the season to be jolly, and so they were. The two elves were dressed to finery. Where was Santa ? The smiles as I walked in, not only on my face but theirs too. I won a Panini, my coffee with an Amaretto muffin, was full of Christmas. My smile stayed on my face as ​I shopped for Christmas presents. I love Christmas. And wish you all a Merry Time. Laduree Cannes ... Laduree is Paris based, but every where you go there are always beautiful Macaroons being offered, I had found a new one, Licorice, tasty, and they do know how to serve a wonderful box of Macaroons, my only decision was to the fact of how many should I be treating myself with. Being in love with Macaroons I decided to make sure that I had enough for my stay in Cannes. I have had the pleasure of tasting these in Paris. A sure way of understanding the love of food, and yes it is Soul Food. 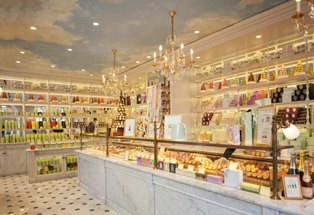 It brings a smile to my face, of course no one can compete with Laduree, or with me. Lenotre Cannes ... Now I had heard of these, and again no one can compete, the beautiful cakes were there to see. Choices, they should of had miniature ones that I could of had many different cakes. French again at it's best. Chocolate Cake, and Lemon Tart, everyone likes a tart ! Both these shops are on the main shopping street in Cannes, and certainly worth a visit. Soul Food for sure. The French are very attentive. Cafe' Roma Cannes ... This was the first place for me to try, I was slightly tired, as Christmas had been a rush. the flu was everywhere, and I was trying not to let it win. So a Champagne with Pimms, and a Chocolate Crepe, bottled water has to be Evian. Very busy place, and I had been noticed. It didn't stop the service being attentive. I was looked after, people looking in the window at me. I had reached Cannes. A definite Soul Food for sure. Locals came in, French chatting was loud, even louder. It most certainly had the Ambiance. La Grand Cafe' Cannes ... My goodness have I really done it again, this time it was coffee, and crepe, Chocolate of course. Very tasty. I had just been in the Christmas Market that was situated right beside this Cafe' ornaments to buy, a gingerbread teddy, and a glass of Champagne, I certainly do know how to live, and work, all for research, what a way to research for a magazine. I even managed to persuade the head waiter to let me take a bottle of water with me, as long as I returned it all was ok. Nicely situated. People watching is a must. Cristal Beach Cannes ... This was a beach Cafe' which I popped in for a coffee, and they were so attentive, they knew who I was, and looked after me, slightly intrigued, but never the less made sure I was happy. My experiences with Beach Caffe' are not the best, looking back to Spain. But France seems to be different. There is not this dis-respect as there was in Spain. People were very respectful of me. Thank you, and the views were beautiful. Thornton's Chocolates ... My love, my dream, always for me Soul Food. I had heard that Thornton's were changing there way of reaching their clients, so the internet is the place that you will find them. Choices of Chocolate, choices of divine tastes. Fulfilment; life is too short to do without the treats of heaven. Just sitting with a glass of Prosecco, or Champagne, and Thornton's Chocolates is my idea of heaven. Chocolates sent through to those you love, a really good way to say "I love you" I have just sent a box to a couple who have managed to stay married for 50 years. In all their hardships, and pain they have stayed together, and sorted out what they have needed to. It is a rare thing indeed to see couples stay regardless of the pain, childhood has brought, the pain that has never left their heart, and soul. But the box of chocolates are the soul food of love, and the heart of healing. To have or not to have. These are worth their weight in gold. Soul food forever Soul food. The box is in itself so beautiful, and that is before you open it to get at the Chocolates. Each Chocolate has a rightful place to be in the Soul Food collection. A must have for any Christmas, New Year table. It will be interesting to see if next year at Christmas whether it's the same Chocolates in a different box.